Every week a photo is used as a prompt for the creation of fiction using around 200 words. If you want to have a go, then head here. If you want to read some of the other stories, then head here. If you want to read this story from the start, then head here. Dan and Dahlia staggered through the door, unable to comprehend the events that just transpired. CS no doubt was dead after the elevator fell. Dan slumped into his office chair run his upper hand through his hair whilst Dahlia stared out of the window. 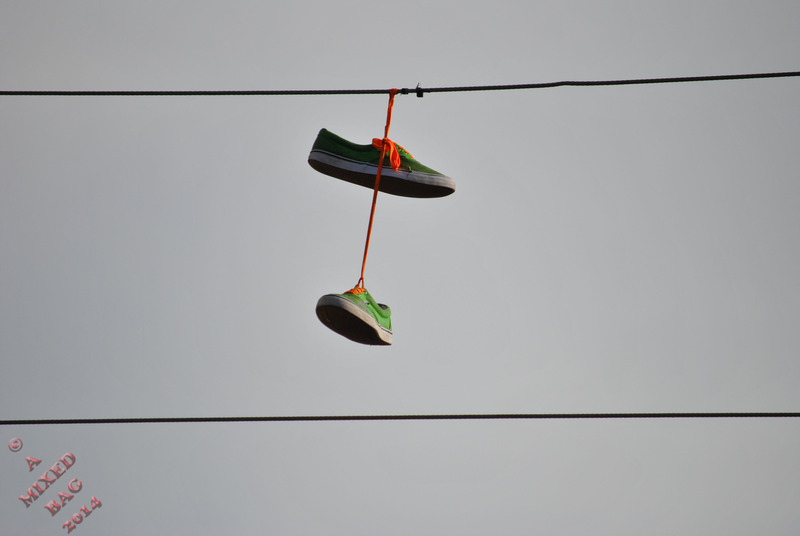 She watched a pair of shoes swaying in the wind as they hung over a cable. In the last few weeks, she witnessed death, kidnapping, torture, violence, dismemberments and wondered how she was still sane. A humorless chuckle escaped her as she wondered if she really was still sane or if this was some mental breakdown from seeing her father dead in the end of an alley. Dan swore and stood with such ferocity his chair flew backwards, bouncing off the filing cabinet, causing Dahlia to jump. He opened a drawer and grabbed a file, and then opened his desk. He handed Dahlia a bottle of spirit, asking her to empty it. As she walked to the sink, Dan quietly slipped a handgun into the back of his jeans, hoping he never had to use it. Just before leaving, he threw all his other files across the floor, making it look like someone ransacked his office. This entry was posted in Fiction and tagged Dahlia, Dan's Story, Daniel's Legacy, Flash fiction, June, Photo Fiction, Postaday, Short Stories, Sunday Photo Fiction. Bookmark the permalink. I did contemplate burning it, but may need to go back at some point. I love this random photo of shoes. It hooks my attention. Shoes are a great prompt. Whose are they? What does that person feel/think in those shoes? Were they once worn by another? If shoes could spread, what would they say? The mind could go on and on. Trying to find different prompts all of the time, must be exhausting for you. It is. Sometimes I will use a photo that I took in the last week, and sometimes I will use one I took years ago when I just pointed and clicked. Pointed and clicked – quirky style. I like it. Every day is a happy day because it is great to be alive. And I thought some body hung them out to dry! Dry what? Is it that ruthless Martini guy? I await the next episode, to see if he’s got a twist.